New: Shop Amazon and help Ugandart FREE! 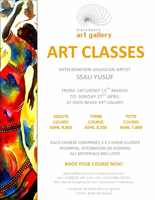 UAC artist Yusuf Ssali has become so well known in neighboring Kenya, he has been invited to teach art classes open to the public at a beach front gallery in Mombasa. The workshops will run from March 15 to April 27.